"A great option for anyone wanting to start learning to play poker or who needs a replacement set." "A plastic coating around both sides of each card will also keep them in great condition." "An indispensable strategy guide for anyone wanting to up their game with a significant advantage." "Lighter than typical t-shirts, this one uses high-quality inks to make sure the graphic lasts years." "Can be used on any hard surface for a more professional poker game." "A full-sized option with hidden storage features." "Using a reliable, hand-driven crank, the shuffler is an affordable option for keeping card decks completely random for each game." You can’t have a poker game without the chips. Betting on hands is the heart of the game. Knowing when to fold, when to bluff and when to just ride out your hand are all integral skills that rely on a simple round piece of plastic. Hobbyists and semi-professionals will often have their own set of chips to carry around for the occasional poker night, which makes a good set the perfect gift. The Traditional Poker Chip Set offers the complete package for new chips. This is a great option for anyone wanting to start learning to play poker or who needs a replacement set. Coming with four colors with different value holders, the case makes it easy to organize and store the entire set with little effort. There are even a couple slots in the case for cards to keep everything together in a single location. A simple game of poker only needs a few things: chips, people, and some cards to pass around. A good deck of cards might seem too obvious as a gift, but you should never underestimate just how useful it may be. A new deck of cards feels fresh and crisp, ready to be played. Better still, since they are extremely affordable, gifting a few decks together will keep the recipient well supplied for a long time. The Bicycle Poker Size Deck is the deck of choice ​for hobbyists and professionals alike. Bicycle has long made a unique deck of cards, thanks in part to their patented air-cushion finish that keeps the surface dry and free from human oils. A plastic coating around both sides of each card will also keep them in great condition even after many intense poker hands. Poker isn’t the easiest game to learn or master. With so many rules, strategies, terms, and random information, a good learning resource like a book can go a long way. Both beginners and experienced players will appreciate the wealth of information a book provides in such a small, easily accessible package. For practice or challenging games, a theory book will keep the player sharp. Those new to the game of poker will appreciate the beginner-friendly book, The Theory of Poker. Going beyond the mere basics of the game, this book is the bible of game theory. Laying out strategies and tactics that the best poker players have developed over the years, this is an indispensable strategy guide for anyone wanting to up their game with a significant advantage. Poker players and fans don’t always need a new deck of cards or chips to feel the love from a good gift. If you want to give them something a little more unique while still being affordable, a t-shirt offers a different way to show some pride. To find the right t-shirt, however, you need to keep the graphics and quality of the material in mind. Cheaply made t-shirts won’t last long after repeated washing, so it’s best to find one that is made to survive. If you want to find a truly unique gift for a poker-playing friend or family member, you will have to start to think a little bigger than cards and chips. In fact, you might find your best choice will be the most unexpected: a poker table. Traditional poker tables are often too big and expensive to realistically gift on a birthday or holiday, but this next choice will do just the trick. Poker on the go, that is what the Trademark Poker Table Top has to offer. Featuring eight individual place settings with chip and cup holders, the table can be used on any hard surface for a more professional poker game. When not in use, the table folds up and stores in the included soft bag for extra protection. The playing surface is made of the same green felt that larger, dedicated poker tables use. If you want to make a grand gesture of a gift, the only real choice in the poker world is a table. The poker table is the central component of any poker game. More than just a stable surface to play on, the table provides an easy way to organize and contain chips and cards for each player. The occasional drink holder doesn’t hurt either. While some tables are too large to be considered a realistic gift, this next one is a full-sized option with a hidden storage features. When the best table is needed, the Barrington Billiards Poker Table is the ultimate choice. This table includes 10 dedicated playing spots with a built-in cup holder. Padded rails will provide plenty of comfort during long games as well. Using a blue felt surface, the table is durable and easy to store thanks to the folding legs. One of the best skills to learn for a poker game is how to shuffle. 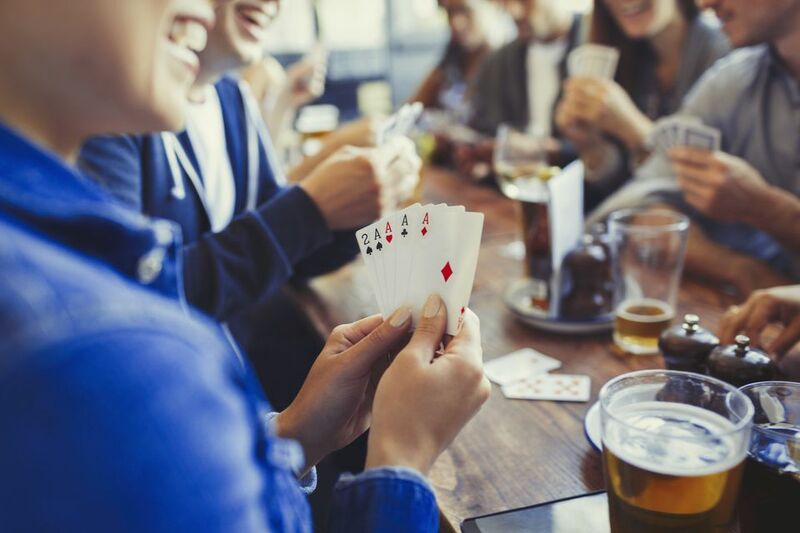 While professional matches have skilled dealers who know how to cut and shuffle any number of cards, the average weekend game will rely on either the skills of the people who attend or the one individual with a card shuffler. This machine, hand-driven or battery operated, will quickly and effectively shuffle multiple decks at the same time. Since dedicated, automatic card shufflers can get a bit pricey for a gift, the best option is the CHH Hand Cranked Shuffler. Using a reliable, hand-driven crank, the shuffler is an affordable option for keeping card decks completely random for each game. The shuffler will take two separate decks and quietly shuffle them in the same fashion as an automated machine. This great gift can accept both standard and bridge-size cards.